Why and How Oracle JRockit? If you enjoyed this post, please considerleaving a comment or subscribing to the RSS feed to have future articles delivered to your feed reader. Hello Jay, i wondered if it is possible to you to make a tutorial about jdbc pool connections. It would be very helpful if u teach this thing with an example of a EJB 3.0 doing the connection. Thanx in advance Jay, and i hope this isnt a problem to you. This is balaji working in Wipro technology. I have joined in wipro 2007 Nov,2007 TO 2008 Dec I have worked as weblogic admin,after am working in core banking applications .Now am planning to go again weblogic ,am already attending interviews. My problem.Please suggest which documnets I have to read to start weblogic .In google so many pdf’s and documneets am getting confused from where I can start and how to plan step by step to depth knowledge in weblgic admin. I don’t have java development knowledge. Hello Jay, i have a request for u. Can u make a beginner tutorial about clustes? how can i configure them and use them in WLS? There are two Posts related to Cluster Setup in the “BeginnersCorner” Page .. Please let us know if you wanted something specific in Cluster configuration Part. BTW what i really want to know if its possible, how to use threads in applications (webapp and EJB). I read that i shouldnt create threads by my self and instead i should to use WLS threads… Can u explain me this please? and if u can made a tutorial with and example would be great! //The Aboe URL should point to all the Managed Servers URL Which are part of the Cluster…. We should never try to Create our own Threads inside the EJB/Servlet kind of applications…because The Application Server Container assigns a new Thread for every request processing…once the request processing gets finished…it assigns the same thread to some other clients request…So if we will implement our own Thread implementation inside EJBs/Servlets then in that case with a small mistake in the Code the Thread created by us may take a longer duration to execute …until that time the parent thread might have completed its Task and Might have assigned to some other clients request…Like this our Threads will remain running inside the container. Apart from this…Many informations like Transactions and Application Context related informations are passed by the Containers via their own Threads…to the other components. So we should never create our Own Threads while working with Servlets and EJBs. Thanx for the explanation Jay, a user from oracle forum recommend me to use the CommonJ Work Manager instead of creating your own custom threads. Can u teach me what is this “CommonJ Work Man…” and how its work? It is not recommended to create our own Thread inside WebLogic Container to perform application specific activity. Because Thread Handling part should be taken care by the Container itself. I understand your requirement …u want an application deployed on WebLogic Server which should be able to get JMS Messages from the MQ-Series… in order to achieve the best and recommended way is creating “Foreign JMS Server” and then configure it to connect to the MQ Series messages…then u can deploy a Simple MDB application inside your WebLogic Server to read the Messages from that Foreigh JMS Server. Apart from this Please refer to : http://download.oracle.com/docs/cd/E11035_01/wls100/bridge/basics.html#wp1162799 The above Link Tells about What is Messaging Bridge And Why/When to use it? Ok, thanx again Jay… u helped me a lot!! If you are using Unix Based OS then you can use “nohup” to redirect the output of your file in the Nohup out file. No If the AdminServer fails …Nodemanager will not restart the ManagedServer. Managed Servers will keep on runnning…. Next time if Admin is down and if you will try to start/restart Managed Servers using NodeManager then they will use the “msi-config.xml” file to boot up. sometimes when i am working on production deployment , some applications is going to admin state instead of retired state . What is this admin state.and i observe some times when i restarting the manged servers , it went to admin state instead of running state, i click on resume after that it will work good , and the state is in running state. when the deployment is in admin state we can not do anything , we cannot delete that application , we can not stop that application , why and what is this admin state means really? There is no hard Rule that Why a Server or An Application Goes into the Admin Mode. But in 90 % cases you will find that some of the System Resources like JDBC/JMS/Application resources are not getting activated properly which causes the Server/Application to Move into the AdminState. To Identify the root cause of these kind of issues we need to set the Server Logging Level to Trace and need to keenly analyze the Complete Server Log …and WARNNING need to be keenly observed. Still if we dont find anything then we to Apply Application Level Debug Flags or Cluster Cmmunication related Debug Flags….based on our Assumptions. Even i asked the developer whether he applied any changes to his code , and he simple said nothing he changed – and with line itself everything worked fine. How to set environment variable in weblogic server ?? And he suggested like environment variable was setup , so asking me to setup. Where can i do this ?? The “java.lang.NoClassDefFoundError: com/csc/mailservice/client/MailServiceClient” Indicates that the Class is Not present in the CLASSPATH. As it looks like that “com/csc/mailservice/client/MailServiceClient” is not a WebLogic Specific class rather it’s an Application or Third party class. So first of all find out the JAR file which contains the Missing Class. Then try to Put it inside the Applications “lib” directory …either “<EAR_APP>APP-INFlib” (incase of EAR application) or inside “<WAR_APP>WEB-INFlib” (incase of WAR application). Hi Jai, Please let me know What is Virtual Host in Weblogic , how to create it & what is the advantage ? Please refer to the following Post on Virtual Hosts….to know how to configure it and Where can we use it? I really thank you for you update. Apart of this I have another question is: when I am restarting a managed server in production environment, it was failed in Admin state. So when I clicked on Resume button for that perticular managed server, it’s become Active.could you please let me know what was the cause lead it to Admin state and how was it become Active when resumed ? Appreciates for quick reply.. If a Server Moves to Admin State It means It is unable to activate some of the Modules which are deployed on this Server. usually it happens If any Application is Not getting activated properly or a Datasource or JTA recoveryor a JMS System/SubSystem is not getting activated properly then also it moves into the Admin State. So To find out the Root cause we need to keenly observer the Logs. Specially we need to check what configuration changes we made on the Server recently. Still if we dont get much informations then based on our assumptions we may need to apply different Debug flags on that Server to get some more information’s on the Server Logs. but want to know how the server state become Active when we clicked on Resume button for that server? I don’t have answer for that question right now…Because after Leaving Oracle WebLogic Server Support i don’t have access to the WebLogic Codes. but i will try to find that answer and will update you as soon as i get the answer. But if you are facing this issue very frequently then i will recommend you to Open a Support ticket with Oracle on this. Because it is not good that the Serer goes into the Admin State. could you please let me know the WebLogic application server specific jar files? and the basic differences between WebLogic and Websphere ? how to give different memory arguments for admin server and managed servers. but the problem is, i want different mem args for my adminserver and my managed servers(ms1, ms2). If you want to provide different Memory Arguments/Classpath to different Managed Servers then in that case you must have to create your own Separate Custom script to start ManagedServers. like “startManaagedOne.sh” and “startManagedTwo.sh”. It is easy…Just make 2 copies of “startManagedWebLogic.sh” which is present inside your “<DOMAIN_HOME>bin” directory and then rename them as “startManaagedOne.sh” and “startManagedTwo.sh” …then edit them according to your Requirement. I am a beginner.I just would like to know how to change the memory arguments(steps) as per the requirement in production environment…. How to configure MQ series with weblogic server. what are the commands used start and stop mq series? i have one more doubt, what is 404error and 500error and hwy does it occur and what are the steps to trouble shoot those errors. Am a beginner they asked this in the interview which i couldnt answer them. so please explain about these? I’ve created new “WebLogic Domain” in production mode for WL version 10.3.3. So whenever i start the adminServer , I was prompted to provide username/password. Saved the txt file with boot.properties under above mentioned path. But still i was asked to provide username/password..
Can you help me how to fix this ? You mean to add the java options in setDomainEnv ? If so , do we have any specific line where we can add them..? Can you please let me know. Thanks most of my issues were getting resolved. How many JVMs we have ??? Those 3 are the Most popular and most common JDKs which are used in 98% environments. Still there are many other JDKs but those are not much popular like HP Jdk, Azul Jdk (also called as AVM), …etc. Do you have any link for Weblogic Download for Ubuntu 10.10 64 bit. I was looking for wls1032_generic.jar. Could you explain about thread dump, thread execute and analyzing thread dumps. I would suggest you go through the below post which would give you an idea on your questions. In case put some real time example and analysis would be of great help. Thank you for the suggestions, we would try our best to write posts with real time examples. We also know that Beginner’s Corner & General Weblogic pages are the highest hit pages and we are planning to get more topics for it in coming future. Can we have the topic MDB’s added and a brief explanation on it. MDB with respect to Weblogic. What role it play in JMS. Please confirm me on this..
MEM_ARGS, that we specify in the scripts,its at a Domain level Right? Each and every JVM instance in the domain will have the same initial Memory and Max memory available, Right? with their own Memory settings defined in their own scripts….which is very easy …Just copy and paste the default “startManagedServer.sh” and add the JAVA_OPTIONS in that. Please let us know what are the rest available.. I encountered a performance problem. My system has lots of threads being blocked by a [fat lock] of DataSourceManager. The threaddump is as follows. Sorry, don’t know how to post an issue yet. We are not able to see the complete Thread Dumps…Is it possible for you to please mail us the Thread Dumps on “contact@middlewaremagic.com” …It is always recommended that we should have atleast 4-5 hread dumps taken in the interval of Each thread dumps when we see Stuck / slow responsivness of Servers. I have deployed the library file and ear files which i deploy will reference this library . The state of lib file is showing as new , when i tried to stop it says the below. The library has been excluded. Libraries are always managed as part of another application. – Warning–	All of the Deployments selected are currently in a state which is incompatible with this operation. No action will be performed. How can i make that lib file as active . I tried to stop the applications that reference this library file and tried to start the lib file but also it throws same error . Could you please suggest me on this issue? If i need to deploy the higher version of lib file , i need to undeploy the existing lib and deploy the new lib .But what will happen to the applications that reference the old library , Whether i need to undeploy those and redeploy ? “A shared J2EE libraries or optional package cannot be undeployed until all applications that reference the library or package are first undeployed.” But for Shared Library upgrade , You can deploy a new version of the shared library by incrementing the implementation version in MANIFEST.MF and then undeploy the older version. That way there is always at least one version of the library available in the server to be a reference of other applications. Just created an account in middlewaremagic,and this is my first post. I have small problem.I have a war file which has been deployed on weblogic 10.3.3.Its working fine. The problem is when ever the user logs in to the application and access the database and then logs out from the application. The thread of the user is still present even though he has logged out. Is there any option which needs to be enabled or disabled in weblogic. From WLS 9.x self-tuning threads were introduced which would grow and decrease automatically, depending on the load. So if more users are coming in then more threads would be produced and once WLS notices it that now there is no need of these threads it would get reduces automatically. However if you need to restrict this feature and want to define a number then you would have to go with workmanager, to get more information on that check out the below link. Just wanted to know Are there any good Documents for tuning weblogic 10.3.3? Here is a small problem f mine. Im tryin using java weblogic.Server utility in an empty folder. still getting the same error. Please let me know where is Native Library(terminalio) located so that i’d be able to try the same after settin it in classpath and PATH. NOTE: Make sure you use an extra (.) dot when you run setWLSENV.sh like shown below and then run the your command. Since i have worked mostly on Oas 10g and now shifted to weblogic.I just wanted to know..whether this is possible on weblogic as well..Im not comparing it. Like in OAS,i could generate a trace file (.trc) of a particular user ie we could come to know..from backend, what all queries are fired and we get a detailed description about how much bytes of data he is using from the network and This was helpful for finding out the root cause of minor issues faced by end users. Last week with the help of you both , i was able to install WebLogic-10.3.3.0 successfully on Ubuntu 10.4 , fine! 1. Using “terminal” , initially installed weblogic ,fine. 2. And then created one sample domain , fine. 3. Before starting adminServer , i just thought of opening one more new terminal , and tail log file to just watch – so just clicked one more terminal. the already running terminal disappears , and even unable to open any other new terminals. “execute” permissions were deleting for /bin directory So anything accessible via /bin will NOT be accessible any more. This is happening only after installing Weblogic , so there’s something going on after installing weblogic which making to delete execute permissions. Do we have anything which making this happen ? any idea? Do we have any place where we can check , or how this happening ? Do we have any fix for this ? I tried uninstalling weblogic , and able to open “n” number of terminals without any issues. Please let me know if anything was un-clear , i’ll explain once again.. Please help me here , because of this i am unable to practice weblogic. The problem of “Disappearing of Terminals” which you faced has nothing to do with WebLogic. Please contact your Operating System Administrator. WebLogic doesnot controls the Terminal in which it runs. I know that weblogic has nothing to do with terminals , but though not sure exactly what’s happening..
Anyways , will take care thanks. Doubt whether my pool has connection leak. So i would like to monitor the open/closed/leaked connection of my data source , was it possible ? In the JDBC Connection Pool—>Configuration—>Connections tab, click on Advanced options. Click Enable Connection Leak Profiling then hit apply. First of all middlewareforums is not maintained by us and we are no way affiliated with or a part of them. They are using the same look and feel for web pages as ours …That’s why we added our LOGO of MM around 3 months back in Middleware Magic to be easily distinguishable. There site was registered around December 2010. So there is no relation between MiddlewareMagic and middlewareforums web site. Thanks for the clarification regarding site , just confused as they were also using the same color and look like magic web-site. And found the option where this Profile Connection Leak exists as ur correct , it’s under Diagnostics tab. And better i start using your PY scripts , they would help more.. Please let me know like anything to be updated? We are not able to see the error which you wanted us to see…..
14 Apr 2011 05:17:52,418 ERROR – weblogic.common.resourcepool.ResourceLimitException: No resources currently available in pool usrdb.tx.ds to allocate to applications, please increase the size of the pool and retry.. Maximum capacity is 15 , so do you want me to increase ? or do we first need to check anything-else ? And suppose if i enable “Profile Connection Leak” , where i need to check/monitor things ? From the error in log it seems that your application needs more connections however data source has been exhausted and all the 15 connection are been used. Now the Maximum capacity is dependent on your application and environment requirement hence try to increase it with a good amount and check if its still running out. I can see my data-source “running” fine. , and even i can test ( testing tab) the pool successfully without any errors. anyways i’ll increase it from 15 – 25 , and check how this goes.. But , do we have any chance like check what all connections being in use currently , and find out if any connection was NOT released after use.. like this , any ? You can also choose the “Active Connections Current Count” to check the current connection used by your applications and as I told before you can choose any other parameters too as per your requirement. This sounds good to me..
I’ll apply these changes ,and keep monitoring them. I’ll get back to you incase of any issues/help. Seriously i have issues in using Ubuntu OS.. so now decided to delete , and go for weblogic supported one. Can you suggest me which would be BEST operating system to install , and have good workflow with weblogic ? Performance wise Red hat Enterprise Linux 5 with WebLogic is a wonderful combination. Do i need to buy , or can i get it for free download? Looks like i need to sign-up before downloading , i’ll make it. Which one should i go for download now? Red hat Enterprise Linux 5 , doesnt exist in the list , so got doubt. This is the point where … we will not be able to help you. Because this time your System Administrator will have to tell you exactly which operating system you are using and What you should download. If i would be you then i will never ask this question to anyone. As your query is not up to the mark …We are going ahead and deducting your 15 Magic Points from your Magic Account. Actually I’ve my own personal laptop where i would like to install a dual boot beside my windows 7 operating system. Is there any document here which tell how to read the threaddumps or any examples? Could you please provide me the link. Thread Dump analysis is a very wast topic and the analysis of it varies case to case scenario…. Can we deploy an application in exploded format in production. what is the difference/advantage between exploded and archive? Please help. As such there is no negative impact of deploying an application in Exploded format in production or development environments. The Only negative impact is ….Exploded Applications cannot be remotely deployed, Only Archived applications can be deployed remotely and Archived applications consumes less space in the disk space. Finally i’ve installed rhel-6 operating systems now , thanks. I would like to install wls_10.3.4 , does everything go well without any issue while installing , and while working..? Any comment on this ? Please refer to the following Video for WLS10.3.4 instalation and configuration. Can you please re-send it for me..? Wow!!! weblogic you-tube version , nice , happy to see this , much helpful. I’ll let you know in-case of any need. You can ignore my above post , because i found out how can i skip if i don’t need any lines. So now I have installed wls_1034 successfully on RHEL-6 , thanks. Now after creating one sample DOMAIN in production mode , i’m unable to makke AdminServer UP(running). Can you please help me in checking this error , and let me know am i NOT able to start.. I really need some help in resolving the problem I have in starting up managed servers after creating the clustered weblogic domain that includes OSB. The weblogic and OSB software were installed correctly and I have the pointbase database started correctly. The Admin server and Nodemanagers started up correctly and the machines are reachable but the managed servers kept giving the boot identity file error messages when they are started from the Admin console. I also tried to create the managed servers using WLST script and/or from the Admin console separately but all to no avail. I also tried to start up the managed server without the cluster but the same result. The only time the managed servers started was when I started them from the command line and pass in the credentials. What can I fix in the server that will allow me to be able to start the managed servers. I just wanted to know few things related to Heap allocation. Currently total of 22GB RAM is available in my one of the Vertual server. It has 5diff. domains. These domains allocatied of 7.5GB. When i try to increase the Heap for one domain, it is not allowing. 1) Can you please explain me how to find the total used Heap in vertual server ( if any unix command)? 2) Also pls let me know formula and how much we can allocate to Heap on the total memory? When I run the stopManagedWebLogic.sh without the nohup command, it runs perfectly! Any suggestions? Just came up with new doubt.Is this possible. I have a Managed Server which is up and running.There are around 200-300 active users using the application.Now due to some reason,i have to stop this Managed server.I have msged all the users to log out and log in to application which is deployed on other Managed server.But still the users are connected to the old Managed server..I can forcefully stop managed server but the users will face some porblems. So Is there a way to STOP the NEW users to connect to this old Managed Server..so that the old user who are already logged in will work and once they are done they will log out..and once all the users are logged out.I can stop the managed server. I think you can try chosing the JDBC-based Persistent Storage for your HttpSessions so thet the Session Data of the currently Loged in Users will be persisted in the database even if you Shutdown/Crash the Managed Server which is having the Primary Http Sessions for your 200 Active users. And as soon as those iusers will click on the referesh button of the web page they will be redirected to the next available member of the cluster. Will try the above solution. By the way, i did as follows which served my purpose as well. I Just stopped the Managed server and Deployed file with “when Work completes”.Usually,i used to “Forcefully Stop” the Managed Server. When i tried to shutdown with “when Work completes”.The new user trying to access the url used to get http 503 error,While the users who were logged in,were able to work with any problem. I have Came up with a new Requirement. Our Developer Has given a new war file. He his trying establish database connection through datasource ie through connection pooling. Previously,we had a war file in which the connection to the database was present IN the war file itself. The developer has provided me context.xml file for tomcat,he wants that context.xml file specific for weblogic. Searched Google for the same,Never got any specific solution for the same. 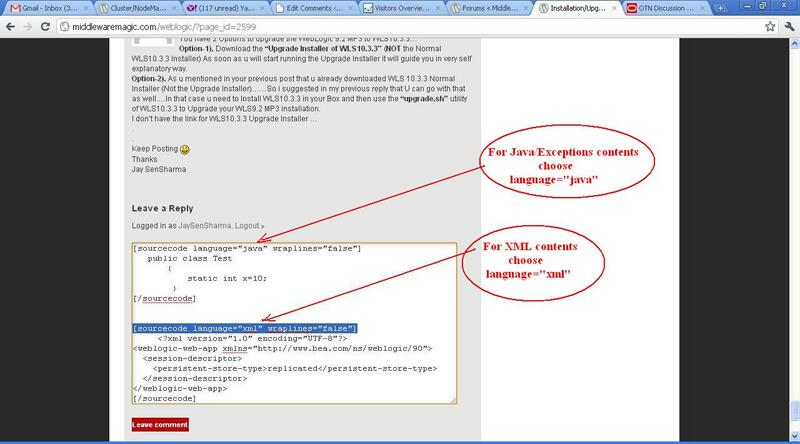 Right now,im confused Do we need context.xml file in weblogic or not. I have created context.xml file as below and then i have deployed the war file. I m getting this below error. Since im not a developer,Cant understand what changes to make. Have created a data source,which has JNDI name as “PooledDB”.But still im getting the above error. Any suggestion please let me know. We are getting an issue in production where an application is present on 2 servers on different machines on a horizontal cluster. The application is going down once every alternate day. It used to happen only on one server, but yesterday the other server also went down. This is what i can make from the log files. well, we get a series of these messages and then that is followed by the java.lang.nullpointerexception shown above. BEA-000628 Created “1” resources for pool “dsSAADE”, out of which “1” are available and “0” are unavailable. BEA-000628 Created “1” resources for pool “dsSAAprod”, out of which “1” are available and “0” are unavailable. If you are worrying about BEA-000628 messages … then there is nothing to worry because these are just INFO messages so There is no indication of a pool tuning problem or config issue at this time. The huge repetition of these messages indicates that Application or the Database or the N/W is closing the connection and the application is asking the pool to provide another fresh connection, which invoked the pool’s test-on-reserve and replace. So that time you will see this message. If you really want to know what is happening with the Jdbc connections then please apply the JDBC related debug flags from the admin-console to get more information’s. Only Developers can tell us exactly what kind of actions are they performing at line 699 inside “com.nvd.saa.SaaCache” class “rutusArray” Method, which is throwing NullPointerException. How do we send an email alert to an admin if the health state of the server is not OK, but the server state is RUNNING. This is happening for us and i want weblogic to send an email to me as soon as this happens and i want to restart this server as this happens. You can use the JMX code mentioned in the following link to get the Health State of your Different WebLogic Servers (http://middlewaremagic.com/weblogic/?p=2851) …. Run this JMX Code using Windows Scheduler …. if an email is not desired, i want to just restart the server as soon as the health status is not OK ??? 1.From the stats i see there are Max of 200 connections and 120 available, but when does it settle down to 0 ? Currently we have ‘Active Connections Current Count = 0’ and timeout as Zero seconds. When does ‘Num available’ settle down to 0 ? 2. What does ‘Curr Capacity High Count ‘ , ‘Active Connections High Count’ and ‘Waiting For Connection High Count’ mean? 1.From the stats i see there are Max of 200 connections and 120 available, but when does it settle down to 0 ? Connections would not go to 0, this is because the Initial Capacity is set to 5. That means the lowest the connections can go to 5 and not 0. Currently we have ‘Active Connections Current Count = 0′ and timeout as Zero seconds. When does ‘Num available’ settle down to 0 ? Curr Capacity High Count: Highest number of database connections available or in use (current capacity) in this instance of the data source since the data source was deployed. Active Connections High Count: Highest number of active database connections in this instance of the data source since the data source was instantiated. Active connections are connections in use by an application. Waiting For Connection High Count: Highest number of application requests concurrently waiting for a connection from this instance of the data source. What should i change to make the Num Available to settle down to Initial Capacity, because i see though there are no active connections the Num Available is the same and not settling down. I have Shrink Frequency of 900 Secs. I have this error in the logs, i tried searching but find many reasons like , TCP/IP, memory , Database errors, but could not single out. What could be the possible reason for this error and what should i look for? I am pasting only few excerpts from the stack trace, the log is too big to paste here. I can send it in an email if you need for further diagnosis. Thanks for your time. b'] Root cause of ServletException. com.ibm.db2.jcc.b.SqlException: [ibm][db2][jcc] Invalid operation: Connection is closed. com.ibm.db2.jcc.b.DisconnectException: [ibm][db2][jcc][t4] A communication error has been detected. Communication protocol being used: TCP/IP. Communication API being used: SOCKETS. Location where the error was detected: Reply.fill(). By default the ResultSet object which we receive from the IBM DB2 Driver is not scroll sensitive so if our application tries to iterate the previous record in the Results set then we face this issue, Because the IBM DB2 driver closes the object if we try to traverse in the resultSet in reverse direction So please make sure that your ResultSet object is Bidirectional / Scrollable… We can get the resultSet object like following to make it scrollable. It is basically a DB2 Jdbc Driver BUG …it will be better if you can contact the IBM regarding the issue to get a fix. Why and How to use Apache CXF Service in WebLogic 12c ? skb5 on WebLogic Server is in ADMIN State ?